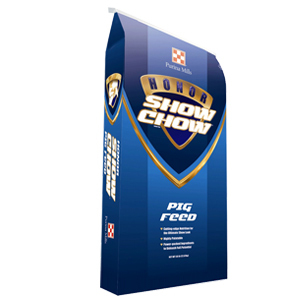 Honor® Show Chow® Showpig Base is designed to be mixed with grain, soybean meal, and fat to manufacture nursery feeds for young piglets and Showpig feeds. Refer to the chart below for mixing directions: Pig Weight (lbs).....................................15-20........20-30........30-50........50-100........100-150........150-Show Crude Protein, %.........................................22.0............21.6...........21.0...........20.0..............18.0..............16.0 Lysine, %...................................................1.50............1.40...........1.30...........1.20...............1.00..............0.90 Crude fat, %................................................6.70............6.40..........6.10............5.30..............6.10..............6.50 Ground Corn..............................................700..............790...........875............1135...............1250............1390 Steam rolled oats........................................200..............200...........200.............. - .................. - ................. - Soybean meal (47%)....................................440..............465...........580............570................485...............410 Showpig Base.............................................500..............400...........300............150................100................50 Ultracare HML Premix OR Commercial Sow 100 Premix........................90.................75..............75..............75..................75.................75 *Bentonite or Novasil (flow agent)................20.................20..............20.............20..................20.................20 Fat............................................................50.................50...............50.............50..................50.................50 Total......................................................2000............2000..........2000..........2000............2000............2000 *Helps ground, high fat feed flow through feeders. Flow agent is optional. ** Add medication of choice at the expense of corn. Reminder: Feed is perishable and should be stored in a clean, dry, well-ventilated area so it will remain fresh and palatable. DO NOT feed moldy or insect infested feed to animals as it may cause illness, abortion or death. Fresh, clean water should be available at all times.